Susan K. Green in no way feels her book, Confused…A True Story of Flawed Love, Control and Abuse, contains a unique story line. Bad marriages and 'badder' divorces have long served as fodder for books, movies and talk, lots of talk. 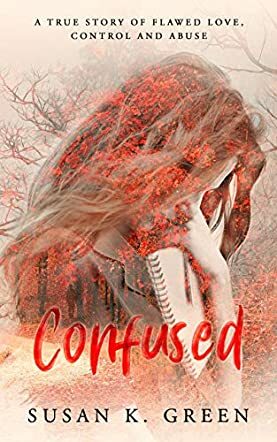 Confused contains universal themes of love's many nuances, appearance versus reality, the futility of changing or fixing someone, discovery of inner strength, and many others to which readers can relate on some level. A believer of 'what doesn’t kill you makes you stronger,' Susan hopes her cautionary tale will offer encouragement, affirmation and, even, entertainment. Confused: A True Story of Flawed Love, Control and Abuse by Susan K. Green is a memoir whose title aptly captures the theme and describes what readers will encounter in this book. Ruthlessly honest and at times raw, this is a tale of a toxic relationship, of control and abuse. We meet Rosie and Carl, two intelligent and attractive individuals who seem to have everything they need to build a successful relationship. While they look great on the surface, each hides insecurities and pain within. While Rosie seeks ways to understand her personality and accept who she really is, Carl prefers subterfuge and to keep his real personality hidden. The consequences are that to get what he wants in a relationship, Carl will use abuse. Can Rosie ever find inner freedom? This is a moving story, told forty years after, and readers will explore the world of courting and the excitement of falling in love. The author describes her teaching job, her friendships — and I love Lucy and the way she helps bring out the author's emotions — and the painful journey towards self-discovery. Susan K. Green explores how we can be blinded by love to the point that we refuse to see reality for what it is, bent on twisting it to suit what we want it to be. But in the end, truth always stares us in the face. While this memoir tells the story of an imperfect relationship, it also explores personal choices and the power of listening to the silent voice within. Confused: A True Story of Flawed Love, Control and Abuse is written in a beautiful, engaging, and enticing voice, a narrative that reflects the reality that many couples go through. As I followed the story of Rosie, I could feel and see myself in many areas of her life. ...Thank you for bringing clarity to strong women who ignore the red flags, think they can lovingly “fix” the abuser with enough love, realize they cannot, and slowly regain their strength and get themselves out!!!! It so needs to be addressed with honesty and transparency. You accomplished both plus added a little humor!!... word-choices are spot on; ...epilogue is perfect. ...took me back to those years of exploring the nightmare of the dating world and into the universally shared experiences of the search for true love...It all reads so REAL…can relate to the emotions and the excusing...stayed in my marriage way too long because I felt powerless!! a story many women can relate to; husband started book last night and is already caught up in it;...got nothing done today…started reading and could not put it down; read in the shortest period of time of any book I can remember; stretched my bedtime reading threefold; definitely deserves five stars! excellent writing; a gripping suspenseful read; should be on every twenty-something's reading list; who knows, it might be made into a movie one of these days!